The digital file of this photo came to me via Dieanna and Jim Swearngin. They were uncertain of who the woman in the photo was. Fortunately, I have a photo of Rachel Jane Brewer Henderson from this era and it matches her in appearance. David Nathaniel Brewer b. 1850 Oct 31 at Pleasant, Steuben, Indiana, was a sibling of Rachel Jane Brewer b. 1852 Oct 6 at Terra Haute, Vigo, Indiana. 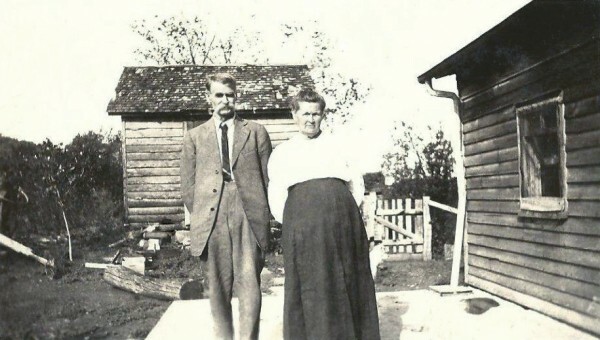 She married Atwell Henderson 1866 in Moutrie, Illinois and they settled in Chautauqua County, Kansas. 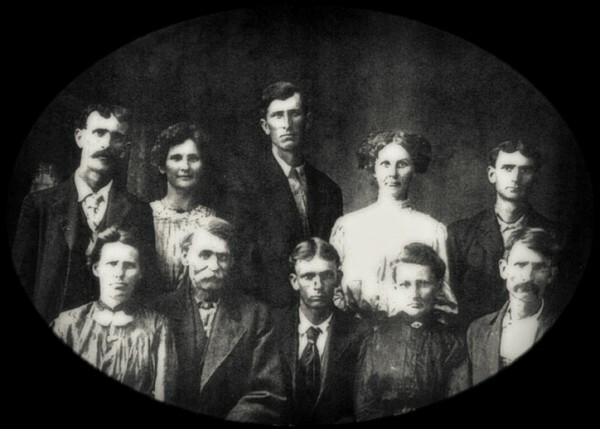 David married Delana L. Jane Fowler 1869 March 1 at Osage Mission, Neosho, Kansas and they settled first in Central, Barton county, Missouri and then in Dade county, Missouri. 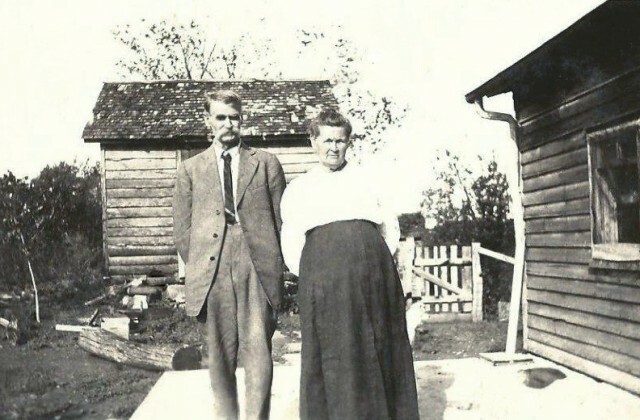 I’m currently uncertain where this photo might have been taken, but as it passed down through the Levy Jones and Jessie Brewer Jones family it may have been taken in Dade county where Jessie and Levy lived. Above is the original photo. As with almost all my files, it was a small digital file but I thought it might be nice to try touching it up just a little in order to distinguish David and Rachel just a little from the surroundings. 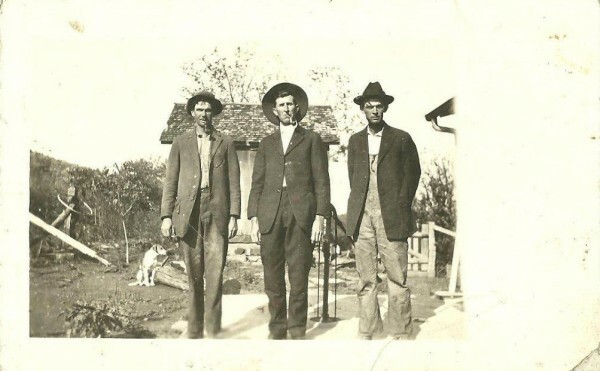 Another photo appears to be from the same day and shows three unidentified men. I did a little fixing up of it. My guess is that Lewis Brewer is the individual in the middle, b. 1880, son of David Nathaniel Brewer and Delana Fowler Brewer. Here is a group shot of David and Delana’s family showing Lewis Brewer. He is the man in the middle of the top row. To learn more about the below photo click here. 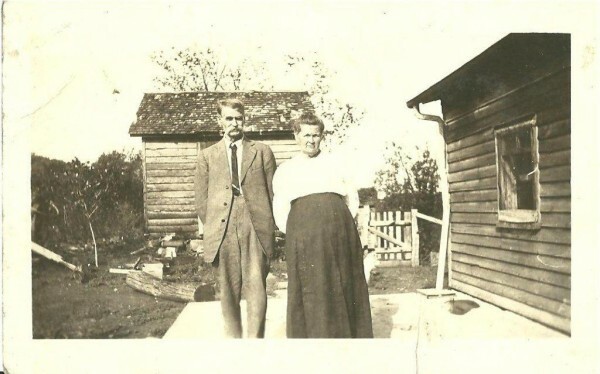 David Nathaniel Brewer was the father of my great-grandmother, Bettie Brewer Noyes.